High Potency Multi-Vitamin C powder with Acerola Cherry Extract and Wild Rosehip Powder. This formula provides high levels of vitamin C in the preferred form of sodium ascorbate and the synergy and completeness of acerola cherry extract and wild rosehip. Wild Rosehip: this provides a broader action and a synergy with the other ingredients. Acerola extract is valued for its gentleness of action and superior effectiveness, compared with isolated Vitamin C. One of the few products on the market that is retained by our body. The fruit of the Acerola is one of the richest-known natural sources of vitamin C. It contains an array of bioflavonoids, vitamins, minerals & other phyto-nutrients; an ideal food-based source of nutrition. The free radical scavenging benefits are useful for lessening the tendency to degenerative disease and fighting cellular aging. Conversely, large doses of isolated Vitamin C can lead to imbalances such as anxiety, poor sleep & mineral depletion. We have found, however, that moderate daily doses of Sodium Ascorbate are well tolerated, even by sensitive persons. 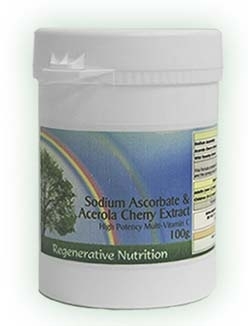 We have now combined Sodium Ascorbate powder with Acerola and Wild Rosehip to provide an ideal, cost effective, solution for a food state Vitamin C.
This formula provides both high levels of vitamin C in the preferred form of sodium ascorbate and the synergy and completeness of Acerola and Wild rosehip. Suggested Use: 1 level teaspoon (2g) dissolved in a drink twice daily. Children (6+) & Sensitive Types: 1/2 level teaspoon (1g) dissolved in a drink twice daily. This formula provides both high levels of vitamin C in the preferred form of sodium ascorbate (see separate article on this) and the synergy and completeness of Acerola Extract and Wild Rosehip. These are remarkable and have far reaching implications for many health conditions. Following a Sodium Ascorbate regime over a period of around 12 months or so, will tend to completely rebuild the structural integrity of the body via collagen renewal. This includes the arteries thus reversing the development of atherosclerotic disease and helping to prevent heart attack. Further, it will resolve hardening or blocking of the arteries and help prevent stroke due to arterial or vascular rupture. In addition sodium ascorbate has a leading role to play in the elimination of chronic and acute infections. Ascorbate is also essential for the hydroxylation of the amino acid Proline which forms hydroxyproline - a major component of collagen. Collagen is an essential structural protein in the body accounting for around a quarter of all the protein in our bodies and is critical to the structural integrity of our bodies. Linus Pauling PhD (Twice Nobel Laureate) stated "It is highly probable that most people in the world would only receive 1- 2% of the amounts of Ascorbate that would keep them in the best of health". Bioflavanoids work with pure Vitamin C (ascorbate in various forms) to produce a more complete anti-oxidant. It would seem logical that the addition of sources of bioflavonoids to the diet or as a supplement will complement and broaden the action of sodium ascorbate. We therefore add 40% Acerola Cherry powder and 20% Wild Rosehip powder to our sodium ascorbate. Why do we need Sodium Ascorbate? The GLO Gene is absent in many people, scientists believe that this happened around 60 million years ago. The absence of this gene makes us unable to biosynthesise a specific enzyme L- gulonolactone oxidase. This is an end stage liver enzyme that bio-converts blood glucose to Ascorbate, this means our bodies cannot produce any Ascorbate. In the long term, a lack of Ascorbate causes our bones to dissolve and teeth to fall out - in other words sub-clinical scurvy and a tendency to development of cancer. Ascorbic Acid has mistakenly been called Vitamin C - it is actually a liver metabolite rather than a vitamin. It is produced in large quantities in almost all animals, e.g. 6 grams a day in a goat, or up to 100grams daily if the goat is stressed. But it is not Ascorbic Acid that our body requires, rather a SALT of Ascorbic Acid. A daily supplementation of Ascorbate several times a day is a simple way to make up for this genetic defect. In the 1970s, Dr. Irwin Stone released a classic book "The Healing Factor - Vitamin C Against Disease" - this is unfortunately no longer in print. Dr. Stone dedicated his life to researching the benefits of multi-gram consumption of Ascorbate and was the author of over 120 scientific papers including over 50 on Vitamin C. He received many awards and honours during his lifetime. In the 80s he published a paper "Scurvy, the most misunderstood epidemic Disease in 20th Century Medicine", this paper has considerable implications for cancer patients. "Because of the poor and inadequate full correction of the human defective gene for GLO (too little Ascorbate daily intake), every cancer victim was born scorbutic, after a 9 month intrauterine bout with scurvy. This poor correction, due to grossly inadequate daily intakes of ascorbate, continues throughout the lifetime of the victims, exposing them constantly to the deleterious physiological insults of chronic sub clinical Scurvy (the CSS Syndrome). This is a large factor in the genesis of the cancer. Every cancer victim being treated by orthodox oncologists suffers also from a bad case of the CSS Syndrome. When the orthodox cut, burn and poison techniques prove too much, the cancer victims do not die solely from the cancer lesion, but are also pushed into their grave by the exacerbated uncorrected scurvy that is always present. We and other workers in this field haven't really realised the enormous size of daily dosage of ascorbate required for therapy and survival in cancer". Dr. Irwin Stone: from his book "The healing factor - vitamin C against disease"
Robert F Cathcart MD, another medical pioneer who has had great success with Ascorbate, successfully treating over 25,000 patients with large doses, often as high as 150gms per day healing all kinds of chronic degenerative disease. Dr Klenner UMD FCCP began his ascorbate studies in the 40's and treated 30 or 40 patients a day in North Carolina until his death in 1984, treating many degenerative diseases. He also found that treating with ascorbate during pregnancy resulted in a much healthier mother and baby. If a mother takes high does of ascorbate in addition to other measures such as folic acid and avoiding cigarettes and alcohol, she will deliver an extremely healthy baby. Studies have shown the labour will also be quicker and less painful. Giving the child 1 gram of ascorbate per day up until the age of 10 will bypass all regular childhood diseases including measles, mumps, chicken pox etc as well as common airborne infections. The availability of the sodium salt of ascorbic acid for oral use represents a marked advance in the therapeutic approach to allergy. In many cases considerable relief from allergic manifests and in some cases even striking and dramatic improvement. The sodium form of ascorbate is thought to improve adrenal metabolism. This regular use of sodium ascorbate at least one gram twice daily has been found in clinical studies as far back as the 1940's to have a high degree of success in the resolution of hay fever and asthma, see the article sodium ascorbate in the treatment of allergic disturbances here for details of asthma and hay fever treatment and also some discussion as to why the sodium form of vitamin C is by in large the preferable form. These conditions are related to an under functioning of the adrenal glands in the sense of failure to produce enough natural steroids. This in turn is related to an over activity of one part of the immune system, tending to produce the self-attack syndrome that plays a part not only in asthma but all auto-immune disorders. The fact that clinical trials have been done on asthma and allergy sufferers is not an indication that sodium ascorbate is only therapeutic for these auto-immune disorders, but rather a strong indication that all auto-immune disorders will tend to be helped with sodium ascorbate use, as the mechanisms described are not specific to asthma only but to all auto-immune disorders. I refer the reader the full autoimmune articles here and also to the liquorice product info here to further understand and alleviate auto-immune disorders. Most chronic (long term, rather than short episodes) disease has an autoimmune component we believe, where there is excess activity/production of B cells and under activity /production of T cells. How Much Sodium Ascorbate is Required? Every individual is different; therefore the amount will depend on personal physiology. Everyone has an ideal dose that will be discovered through an element of trial and error. By ingesting a series of incremental does every four hours, your body will reach a tolerance level known as the Bowel Tolerance Threshold. This is a state where the tissue cells have become fully saturated with the maximum amount needed for the body to heal itself. The Bowel Tolerance Threshold is not diarrhoea as it is not acidic and will not create the burning associated with diarrhoea. At this point, the dose is reduced by small amounts to come below the threshold. We recommend that you begin with half a teaspoon (approx 1 gm); each subsequent does should be increased by a further half teaspoon. The increases should not exceed this amount. The four hourly regimen does not need to be continued during the night, simply begin again in the morning. This regime can be followed preventatively for long term tissue and organ healing. Dedicated Vitamin C health researchers believe that the other mechanism by which arteriosclerosis proceeds is due to a lack of ascorbic acid causing weakening of the collagen throughout the body, but specifically of the arterial walls, leading to weakness and micro haemorrhage / bleeding of the arteries. These conditions promote a deposition of waste materials to act as a kind of cement to protect the arteries from rupture and leakage. This deposit eventually reduces circulation and can result finally in death via heart attack, due to complete blockage and lack of oxygen reaching the heart, or stroke due to complete blockage of a blood vessel to the brain, or rupture of a blood vessel due to collagen so weak that not even the deposit can prevent it breaking. By using Vitamin C daily this cycle is broken, and the strengthening of the collagen of the blood vessels, will according to the researchers in this field, eventually lead to decongesting of the arterial tubes. Oral chelating agents like Serrapeptase have been shown to rapidly help in arterial clearing. It is a myth that Sodium per se will raise blood pressure, but for a very small minority of people who are truly hypertensive, sodium MAY raise blood pressure, dependant on many factors including the ratio to potassium, in such cases ascorbic acid can be taken instead of the salt of ascorbic acid. It should be noted that sodium ascorbate contains only 10% sodium.